Natural Remedies for Chronic Conditions and Weight Management: Which sugar is good for you? Which sugar is good for you? 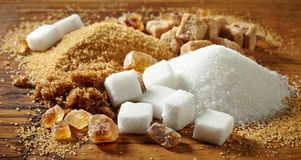 There has been a lot of publicity of late regarding sugar and its relationship with the diabetes and obesity epidemic. All sugars affect your insulin balance and metabolism. If you have diabetes, candida, yeast or fungal infections, autoimmunity or are having a battle with your waistline, all sugars should be avoided. Artificial sweeteners (zero calorie sweeteners) are no better solutions as they can be toxic to your body. One in three adult New Zealanders is obese, and this is a serious health crisis. If you fall into that category, please avoid all natural and artificial sweeteners. However, if you are a healthy adult, you can have some natural sugars from raw honey or maple syrup. For both these sweeteners, choose the darker varieties. NZ active manuka honey is known for its non-peroxide antibacterial activities, which is unique and has been proven to react against Staph aureus. All honeys contain peroxide antibacterial activity. Honey is high in fructose (with some sucrose and glucose), as well as minerals and vitamins. Honey is also a demulcent which soothes the mouth and throat. But, if you are diabetic, insulin resistant, FODMAP and/or overweight, you should not consume honey. Maple syrup is a natural sweetener from the sap of the maple tree. It is rich in minerals, particularly sodium, magnesium, potassium, iron, zinc and manganese, vitamins and polyphenol antioxidants. Maple syrup is high in sucrose (with some fructose and glucose). It has a lower glycemic index than table sugar and less processed. On the other hand, there is agave, table sugar, artificial sweeteners and high fructose corn syrup. These sweeteners are a no go, because they are low in antioxidants, some are even artificial, as the name suggests and toxic, so using them to sweeten will just raise your blood sugar, crease an insulin spike, without any other added benefits of antioxidants, minerals or nutritional benefit. And the whole idea of sugar free? You need to be cautious! If you see the label “Sugar Free”, always check if there are artificial sweeteners. Technically there is no added sugar, but the product is still sweet. The only acceptable sugar free substitute is if it is sweetened with Stevia or Lovia which typically are plant based sweeteners, Stevia from the stevia plant and Lovia from combining Buddha’s fruit and stevia. Avoiding processed foods is a good way of avoiding added sugar.